Protesters gathered in front of the court Tuesday morning displaying photographs of the Sept. 16 eviction. Phnom Penh Municipal Court postponed the questioning of eight Boeung Kak lake residentsTuesday, after more than 100 people showed up in front of the court to demonstrate. Tep Vanny, who has been a representative of lake residents refusing to take a developer’s buyout in the neighborhood, was summoned for questioning over a counter-lawsuit brought by city officials. 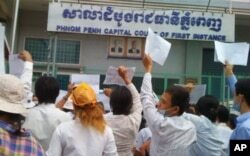 More than 100 people Boeung Kak lake residents showed up in front of the Phnom Penh Municipal Court to demonstrate. The officials say that a lawsuit brought by eight villagers, led by Tep Vanny, against the city and the developer, Shukaku, Inc., claiming they had been left out of a land compromise, was defamatory. Residents issued the complaint after their homes were destroyed in a Sept. 16 forced eviction. Tep Vanny told reporters at the court on Tuesday that her questioning had been postponed due to the gathering of supporters in front of the court. Doung Kea, 43, who lost her home in the eviction and is one of the defendants in the defamation case, burned incense and called for justice in front of the court. 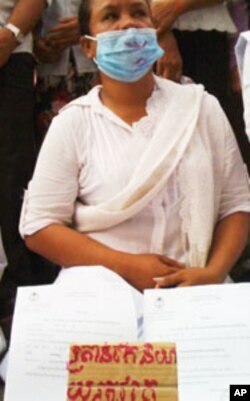 A woman, dressed in white, display documents from the land dispute. “What we built over more than 30 years was destroyed in a second,” she said. “Is that what I hoped for?” She appealed to Prime Minister Hun Sen and court officials to reconsider the case. A Cambodian police keeps order outside of the court. A small number of police were deployed to the demonstration, but they did not disperse the crowd. Thousands of families have been pushed off land near the lake, which is slated for a massive residential and commercial development. Nearly 800 families were given small parcels of land on the site as a compromise for clearing out, but more than 20 families say they did not receive land as compensation and do not want to leave. 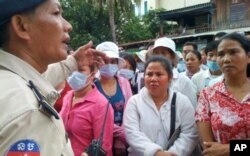 Am Sam Ath, lead investigator for the rights group Licadho, said the problem goes beyond the residents of Boeung Kak. So far in 2011, he said, about 25 people have been arrested for complaining in land disputes, with more than 100 charged with defamation for demonstrations against companies, which have included the destruction of some company property and equipment.